Any time the weather changes, I always want to clear out my closet and start fresh with some new clothing. I stopped by Forever 21 and found so many great items and they were pretty good prices. 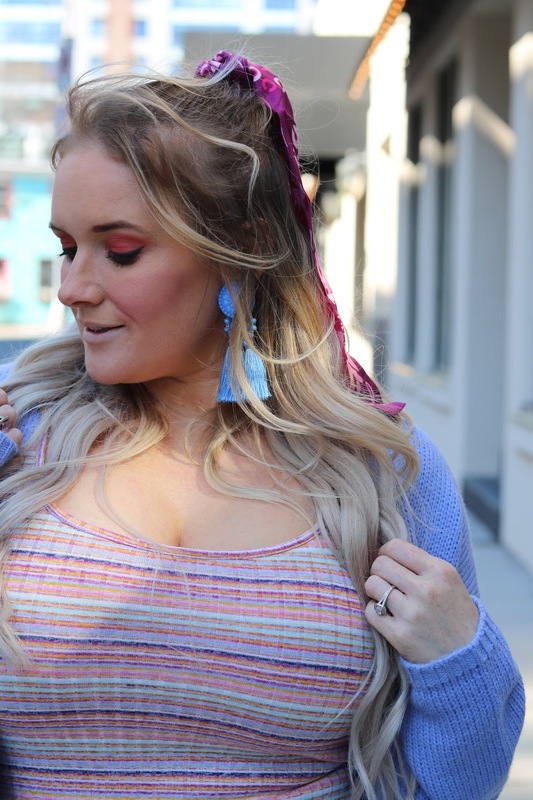 Everything I purchased was under $40 and the prettiest colours for Spring. I seen this gorgeous maxi dress on a mannequin and really liked it but wasn't sure if I needed it. I left the store and couldn't stop thinking about it so I ended up going back and buying it. I'm really happy I did, it's perfect for Spring and Summer and it's the prettiest colours! I think this dress will look really cute with a denim jacket as well. Up next is this gorgeous striped dress. As soon as I seen this dress, I had to buy it! The colours were so darn pretty and fun. 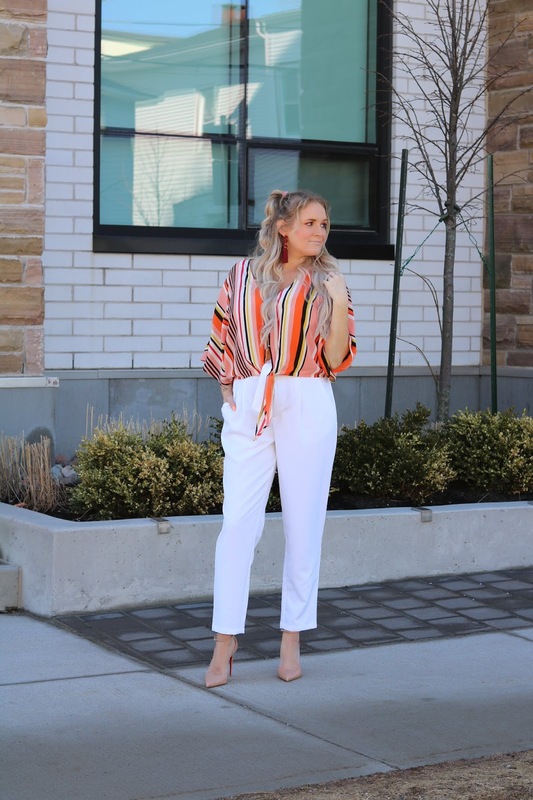 This is a perfect everyday dress for this Spring and Summer. It's great with a sweater, a little jacket or on it's own. You can also dress it up with heels like I did or pair it with some cute sneakers! This striped crop top stood out as soon as I seen it. I love the colours in it and it looked so classy on the mannequin. It's a bit low cut so I'd probably wear a cami underneath if I was wearing it for business meetings. Being my clumsy self lol, I didn't realize that I had tucked the tie to my pants through the tie of the shirt lol!! What can you do?! I fell in love with this sweater as soon as I seen it! They didn't have my size so I ended up not buying it. Again, I couldn't stop thinking about it so I ended up going back and trying it on again. I'm really not a huge fan of crop top sweaters but I really, really loved the colours in this one and the flamingos and palm trees. In case you can't already tell, colours really get to me lol! Which one of these looks was your favourite? I think mine may be the cute little purple striped dress with my favourite purple sweater! I think the colours are so perfect for Spring. SO many good finds!! 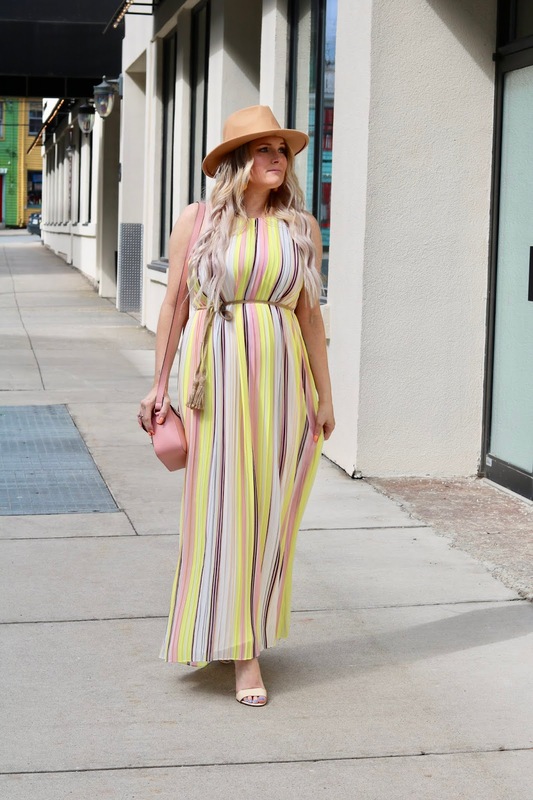 I love the rainbow maxi dress! That yellow and pink maxi is gorgeous on you - I love it!